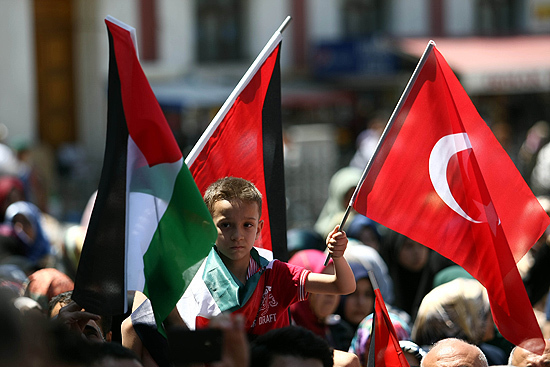 Nongovernmental organizations from across Turkey on Friday condemned Israel for restricting Palestinians’ entry to Jerusalem’s Al-Aqsa Mosque and held rallies in solidarity with Muslim worshippers. Dozens of Palestinians were injured on Friday after fresh clashes broke out with Israeli police outside the mosque, health officials said. Last Sunday, protests broke out after the mosque’s leadership spoke out against metal detectors installed at the site following a deadly shootout last week. The new security measures led to a wave of anger among Palestinians, who called for the immediate removal of the metal detectors. Israel defended the detectors, saying they were no different from security measures at other holy sites around the world.